In a world with so many video screens, so many flickering lights baying for our attention, we need to close our eyes to the halo of perception around us. We have a need to relax our visual cortex from instant gratification and a need to return back to the soul feeding art of story telling. We need to simply hear a story, inspired in the literal sense by the voice of the one who recalls it with fondness or bitterness, whichever the story demands, whenever the story demands it. As the words trickle into, and tickle, our ears as though raindrops from a cloudburst out of our youth, we let our mind’s-eye take over and show us things we once knew as possible. We imagine things we once thought were impossible. Such is the power of the spoken word to move men to weep, and women to fight. If you read that paragraph and imagined the voice behind it, then you are the candidate to record an audiobook. 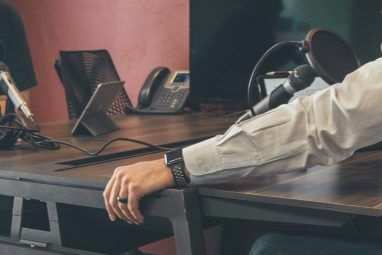 You are the person that I’m speaking to and you may want to take on the formidable, if not rewarding, task of creating an audiobook. As surely as I sit here and type directly to you, as surely as you read this on technology that could have ended Word War II in its infancy, this task IS within your reach. Too much? A little too dramatic? Isn’t that half the fun? Alright, let’s get down to business. We’re going to talk about taking something that you’ve written or read, and putting it into sounds so that you can either listen to it yourself, or share it with others. We’re also going to do this on the cheap. Pencils, maybe even coloured ones. Let’s move forward assuming that you have your recording software installed and have gone through the rudimentary tutorial that probably accompanies it. You’ll probably find that in the menu under Help. Let’s also assume that you have plugged in your headphones and microphone, and tested them out a little bit. We’re also going to assume that you have chosen, or maybe even written, the book that you want to record. I want to take a little bit here to talk about the book you’ve chosen. Let it be something that, if no one else ever heard your audio book, you’d listen to it at least once a year. Let it be something that, if your descendants should hear it one day, it says something about you and what you believe in. That’s my take on it anyway. Just a suggestion. Re-read the book, with your pencils nearby. You could use sticky notes or something else if you want. As you go through the book, make notes about how you want things to sound. Think of these as stage directions. I suggest using a coloured pencils so that you have a visual cue as to what you want to do or sound like when you read a certain part. You know, maybe red for anger or blue for sadness. I think you understand where I’m going with that. Also take a few seconds to just record the ambient noise in the room that you’re recording in. Record the silence. It comes in handy later to fill in gaps or to lead into or out of speech, instead of maybe rustling papers, or coughing. Record at the highest quality that you can. Or at least at a Sample Rate and Format of 16 bit 44.1 KHz. This makes for a pretty large file size, but it’s easier to reduce the file size and retain good quality than it is to try to squeeze quality out of a smaller, poor quality recording. If possible, record in stereo as well. You’ll also want to keep an eye on the Input Levels. If they hit the zero mark, you will get audio distortion. Or, in Average Joe terms, crappy audio. Adjust your Input Volume accordingly as you record. Make sure you have your notes in order, a room that is free from outside noises, and that everyone else in the house is aware that you are recording and not to disturb you. You may want to come up with a visual way of them getting your attention just in case they really need you, say maybe if there’s an important phone call. If you want, you could spring for a fancy On Air light – those are always cool. By doing this, you eliminate sounds that would creep into your recording and possibly detract from your story. 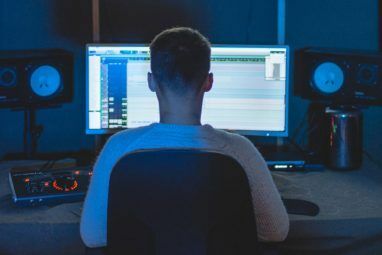 You’ll find some other interesting recording tips and sites in our article, 7 Free Resources To Learn About Sound Engineering 7 Free Resources to Learn About Sound Engineering 7 Free Resources to Learn About Sound Engineering Here's a handful of great resources for you to use if you want to learn more about how to make great music recordings. Read More . Don’t let the Engineering thing scare you. It’s only as difficult as you want it to be. You can record this anyway that you want, but here are a few ideas to consider. You could record it and edit it as you go, something that is referred to as Punch Recording. Or, you can just read it and record it all. If you make a mistake, just repeat that section as you go and take care of the editing later. This is a method known as Straight Recording. The Straight Recording method makes it quicker to record, but probably longer to edit. Straight Recording, in my opinion, is a better method for when you have other performers and someone dedicated to the editing. Break down the text into manageable sizes. By that I mean pieces of text that you can read out loud comfortably, in maybe an half hour to an hour. Ideally, you would record just a chapter at a time, but as you know, some chapters are just a few pages and some chapters can be a third of a book. This’ll keep your voice fresh, and break your recording into natural chapters. It doesn’t hurt to have a glass of water nearby either. A trap most people fall into with recording, as well as with public speaking, is speaking too fast! Take a little time. You are telling a story. Imagine that you’re reading to your kids or future grand-kids. You’ll want them hanging on every word, and you can’t do that if you keeping throwing out new words for them to grab! You can use sound effects and do special voices for characters – there’s lots of room for that and it can enhance the listener’s pleasure. Just keep in mind that you will need to be very consistent throughout the entire book with the effects and voices. If character starts out with a mid-western drawl, they better have it all the way through the book, or the listener won’t know when that character is speaking. If your laser beams sound one way for your galactic emboganizer in chapter 3, they better be the same ones in chapter 103. Unless, of course they’ve been enhanced with dilithium crystals. I’ve mentioned a bit about this, but there always seems to be more editing to be done. It depends what you want to do – you may want to add in sound effects, you may want to just give the whole piece a listen through and make notes on what you want to edit. You may even want to let someone else listen to it to get there opinion and take notes. They may hear things that you don’t, like little pops in your words (plosives) or lip smacking, or maybe some words you kind of mumble a bit through. Maybe your breathing is coming through a little strong. Sometimes that’s appropriate for the part that you’re reading, but if it’s not appropriate then that’s all anyone will notice. If you are using Audacity, Angela Alcorn has a good article on How To Remove Ambient Noise From Your Audio Files Using Audacity How To Remove Ambient Noise From Your Audio Files Using Audacity How To Remove Ambient Noise From Your Audio Files Using Audacity It's really simple to remove ambient noise in Audacity. It'll give you recordings a much more professional feel. Read on to find out how... Read More . Actually, she has a bunch of great articles on Audacity in general. At a professional level, you could be looking at two to four hours of editing for each hour of recording. Is that necessary? That’s up to you to decide. But do pick a point at which you can say that’s enough editing. There are more scientific methods, however this is a very personal thing that you are recording, so you do what feels and sounds good to you. Each chapter should now be recorded and edited, with a nice neat file name and a number. Something like My Story – Chapter 1 – A New Beginning. A naming method like that makes it easier to index on your computer as well as easier to find on the Internet, should you put it out there for everyone. Now you want to convert each of those files into a smaller, more portable and usable format. The defacto standard is still the MP3. In Audacity, you would click on File > Export. In the new window that opens, click on Options. Here you can set the Bit Rate Mode and Quality for the MP3. 192 kbps is recommended by many people, and it does make for a bearable file size with good quality, but I think you can get away with 128 kbps as well. Click OK and let it do its thing. If you’re looking for more precise notes on making an MP3, might I recommend Christian Cawley’s article, How To Create Valid MP3 Files With Audacity How To Create Valid MP3 Files With Audacity How To Create Valid MP3 Files With Audacity One of the more popular open source audio applications, Audacity, has recently upgraded to version 2.0 and is now no longer in Beta. Audacity has some great tools and effects that can be used to... Read More . That’s it almost. Follow the export procedure for the remaining chapters and you’ve got an audiobook. Now what are you going to do with it? So many things that you can do with it – post it on your blog for download, submit it to iTunes or LibriVox, or any one of many sites that distribute free audiobooks The 10 Best Websites for Free Audio Books The 10 Best Websites for Free Audio Books Want to listen to audiobooks without paying a premium? Here are the first websites you should check out. Read More . Maybe you’ll want to record an audiobook to CD and keep it for safekeeping in your own time capsule. I’ve even seen services online that will custom make a vinyl LP for you out of your recording for about $80. How cool is that? With this experience in hand, you may find that this is a fun hobby. You’re learning about public performing, sound engineering, recording distribution, so many new skills from one fun thing! What will you do with it? Have you already done something like this? If you’ve put out a free audiobook, let us know in the comments where we can find it. Let us know what you learned from your experience! Explore more about: Audacity, Audio Editor, Audiobooks, Record Audio. Thank you for this fabulous article. I want to make audio books of several of my own books I have on Amazon and so went looking for producers and narrators. I'd have to sell a lot of books to go that route--average cost for one book was $8500! I despaired of the possibility, and then today found the grand information you have given, even to the extent of enabling some de-breathing tools. Thank you so very much. I feel so glad I encountered this as a way to do the job myself. Totally unexpected! Just a delight. Great article my question is can we record books by other authors and distribute? Or will there be some copyright issues? There can definitely be copyright issues. I'm glad you brought that up. If someone is thinking of doing this, better make sure that the work you want to record is in the public domain, otherwise one could get sued. My question is if the work recorded is from a public domain but the recorded copies are then being sold does that in any way make it illegal? Thank You for this article Sir. I want to start making an audiobook of an Indian Hindi writer Premchandra. 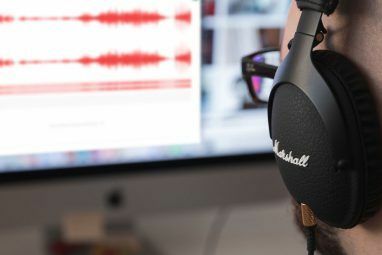 I am new to this and it seems to be exciting and fun.Can you please suggest me if Audacity will be complete and helpful for my voice recording.And while starting recording what should be the introduction.Once again, after reading your article i am feeling like "Yes. I can also do it".Thanks for this. Audacity should do everything you need. There are also many plugins for it that will extend it's abilities. There's a bit of learning, but once you get the basics, I'm sure you'll love it. And the price is right. What should the introduction be? Tough question. It depends on what you are recording. Maybe listen to some different audiobooks that are similar and draw ideas from there. Best wishes! I'm glad to see people making audiobooks. You really CAN do this. What a great article. Concise. Clear. Not a wasted thought or syllable. Thank you very much. We are indeed launching a 4-Book Audio Series and you have simplified the process for us greatly. Thank you! It's a pretty old article, so I hope the info still holds true. It's still a decent place to start though. Best wishes for success with your books! Thank you so much for this informative article. I started out researching local studios in which to record a novel that my husband and I just self-published. My mother refuses to read, says it puts her to sleep, and my husband's aunt is blind and can only listen to books so this will be the only way either of them will find out what a good writing team we are! On the other hand, I've gained so much inspiration from this article that ...well...I may just make a career out of recording books! (LOL) I'm very shy so I'm not sure it will happen but at this moment I certainly do feel like I could do it. Wow, thank you! I'm so glad I could help. This article is a little older and I've since seen some software that might help the home recorder significantly. Blue microphones has a voice recording package of their Blue Yeti mic with a few editing programs targeted at speaking and singing. It's only a couple dollars more than getting the mic alone, and the mic ROCKS so it's worth it in my opinion. Hope that helps some more! When hiring a reader for an audio book, is it assumed common practice to read "word for word", or to read making it "hearer friendly". For instance saying "it's" instead of the written "it is". Or is it the author's preference and should be asked before taking on the "hearer friendly" way. Also, should it be stated in the contract. I've never hired voice talent before so I can't say what is common practice. If I did hire someone, I'd want them to read the text exactly as it is - there's a reason I wrote it that way. To ensure that they stick to the script, it is probably a good idea to have your desires stated in the contract. Man this is an idea. I am trying to start writing an Ebook, but I never thought about an Audio book. This may actually be an alternative. May be launch both simultaneously.At least the competition here might be less since most people would not want to meddle with Audacity. Thanks . 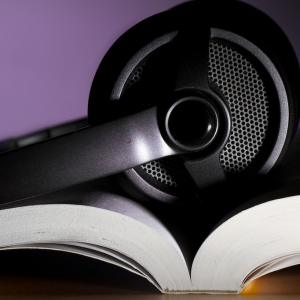 If you have an eBook and an audiobook, then you've added that much more value to your product. It should help. Thanks for the tip.My mother is having a tough time reading now and I was thinking of recording some audio books for her. Do it, you'll enjoy it and she will absolutely love it. Especially if they aren't books you'd normally read. They will give you more insight into who your mom is and you'll be grateful for that one day. At some point in your life, you might not be able to read it again. That's when it's nice to have the audiobook. Plus if you read it, then it will have your take on it. Things I didn't think of. thank you. I'm a little morose sometimes, but we do have to look ahead.